Mars is lacking in the vast supply of natural resources we’ve come to rely on here on Earth, and astronauts attempting to colonize, or even just visit, the red planet can only bring a limited supply of materials with them. Learning to make do with what Mars has to offer is one of the biggest challenges of visiting our nearest neighbor, but the results of the European Space Agency’s latest 3D-printing experiments prove it isn’t impossible. We’ve sent probes and rovers to Mars, but to date it’s only been a one-way trip. Our knowledge of what Mars is made from is limited to what Spirit and Opportunity can learn from samples, and studying Martian meteorites that have made their way to Earth. Like our moon, if there’s one thing Mars isn’t lacking, it’s dust. So as a stand in for genuine Mars ingredients, researchers have turned to a simulated version of lunar soil, also known as lunar regolith. 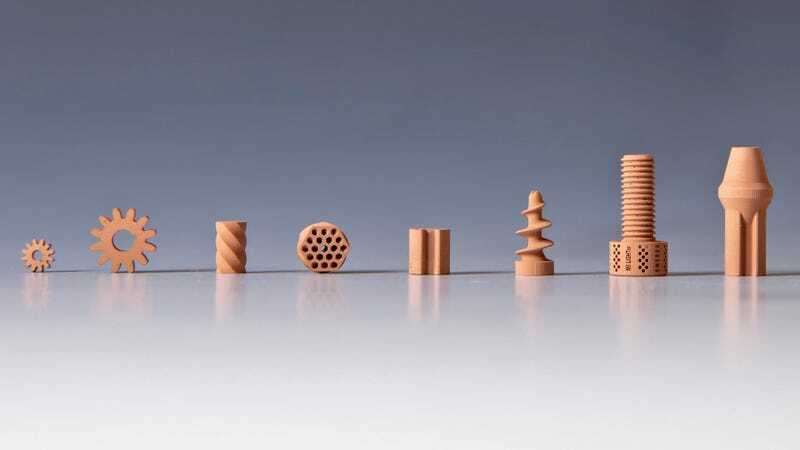 Working with an Austrian company called Lithoz, the ESA 3D-printed a sample of various parts using a light-sensitive binding agent mixed with the regolith—which itself is made of silicon, aluminum, calcium, and iron oxides that have been ground to a very fine dust. Instead of heating the mixture, extruding it like hot glue, and then letting it cool and harden, the 3D-printing technique used here instead lays down very thin layers of the regolith mixture, which are exposed to light, causing the binding agent to solidify. The parts are then baked in an oven to create a solid, ceramic material which is not only strong, but also features a smooth, uniform surface texture so that they’re compatible with machined parts that have been created with very high precision. If you’ve ever held a 3D-printed object made from melted plastic, the obvious imperfections on its surface are easy to spot, and problematic for use in precision machinery. The ESA’s next step is to thoroughly test the strength and durability of these 3D-printed parts, in order to determine if they can stand up to the rigors of space travel, and life in a harsh environment. Eventually, instead of pulling a trailer full of spare parts, a manned mission to Mars would simply have to bring along a digital archive of all the parts used in the ship and other structures, a 3D printer, and maybe a bucket for collecting the local soil. Is Mars really where we want to boldly go next?